How often do we catch ourselves staring upward at an object, in awe of its immense size? When tourists first experience the towering heights of the skyscrapers of New York, they come to grips with the scale of such structures. Sometimes, even the most mundane things in life can be awe-inspiring (or at least attention-grabbing) when reimagined as larger versions of their smaller counterparts. While some of this fascination with gigantic items stems from the art world, there have been many films that have delved into the idea that size matters. In the past, this required building sets to make the actors on the screen seem much larger than they were. Today, CGI can accomplish this task. Even so, some amount of visual trickery is needed to make the actors appear larger than life. This week’s two films examine what it means to be gigantic! Giant robots are usually a sub-genre of science fiction often promulgated through Japanese manga and anime. While they cornered the market on giant monsters and the giant robots built to fight them (a la Godzilla (1954) and Power Rangers (2017), respectively) America is finally starting to catch up with such films as Pacific Rim (2013) and its sequel, Pacific Rim: Uprising (2018). Granted, most of the American giant monsters and robots before this point were in the form of enormous apes or alien invaders, like the eponymous King Kong (1933) or Gort from The Day the Earth Stood Still (1951). All these giant robots and monsters were created in a variety of methods to make the audience think they are enormous, but there’s been at least one true giant to grace the big screen. In his best-known film role, Andre the Giant played the part of Fezzik in The Princess Bride (1987). Upon the cusp of the start of the cold war, tensions are high between the United States and the Soviet Union. When a giant alien robot falls out of the sky and lands near a small town in Maine, the United States government is obviously suspicious of Communist involvement. However, what young Hogarth Hughes (Eli Marienthal) learns upon finding this Iron Giant (Vin Diesel) is that the robot is a calm and docile being with no understanding of the world he now inhabits. The robot does not want to be seen as an enemy, but his automatic defense mechanisms are activated to protect him from the assault of the United States military. Despite Hogarth showing everyone the robot is harmless, a trigger-happy government agent launches a nuclear missile against the robot that would likely wipe out the small town. It’s up to the Iron Giant to save the day and show he’s a hero, not a villain. Size is all about perspective. While humans think anything larger than they are is gigantic, an ant would find humans to be tremendously enormous. Plenty of films explore this shift in perspective. From the superhero comedy of Ant-Man (2015) to the social commentary of Downsizing (2017), being shrunk down makes the entire world seem bigger in comparison. Some family-friendly films explore this idea as well, including Alice in Wonderland (1951) and Epic (2013). Despite knowing how to interact with our human-sized world, like The Borrowers (1997) or The Secret World of Arrietty (2010), sometimes the humans shrunk down to these sizes have difficulty adapting. When toy cars are large enough to be real ones, and building blocks can be used as a shelter, it takes some problem solving to fashion the tools needed to survive. Eccentric inventor Wayne Szalinski (Rick Moranis) is having trouble with his shrink ray. Every time he tries to shrink something, it explodes, thus making the ray gun too dangerous to use on humans. His children, Amy (Amy O’Neill) and Nick (Robert Oliveri) are tasked with cleaning up the house before their mother comes home. Meanwhile, the Szalinski’s neighbors, the Thompsons, are preparing for a fishing trip. Ron Thompson (Jared Rushton) accidentally hits a baseball through the Szalinski’s attic window and is caught by his brother, Russ (Thomas Wilson Brown), and forced to apologize to the Szalinskis. However, when the kids go up to find the baseball, the laser shrinks them down. After Wayne accidentally takes the kids out with the trash, they have to find their way back home in the wilderness that is their backyard. If they can gain Wayne’s attention, they just might be returned to normal size. Some actors just have that “look.” When they’re cast as distinct characters or stereotypes, and they just fit the role so well, there’s no doubt they’re the right person for the part. Perhaps the easiest archetype to cast is none other than the “tough guy.” From large muscles to tattoos to gruff voices, these characteristics are dead giveaways for the tough guy persona. Because of this, Ron Perlman is often cast as the tough guy in a large variety of movies. Not only does he have the “look” for live-action films, but he has the voice for the animated fare as well. The real trick with this character archetype is that they can appear in almost anything. From dramas to comedies and from sci-fi to fantasy, Ron Perlman has done them all. This week’s two films highlight some notable performances from “tough guy” Ron Perlman. Despite being in many “direct-to-video” projects, Ron Perlman has managed to collaborate with a few different directors over the years. One of his most notable collaborations has been with Guillermo del Toro. From their first film together, Cronos (1993), they have gone on to make four other movies together: Blade II (2002), Hellboy (2004), Hellboy II: The Golden Army (2008), and Pacific Rim (2013). Perhaps because Cronos was so early in Perlman’s career, his ability to play tough guy characters was proven here. At the very least, his work with del Toro has enforced this stereotype for him, mostly due to his portrayal of Hellboy (which we’ll get to in a minute). While being pigeonholed into a stereotypical role might seem a disservice to an actor’s career, I think Perlman manages to use these roles to his advantage, continuing to prove what a badass he is. 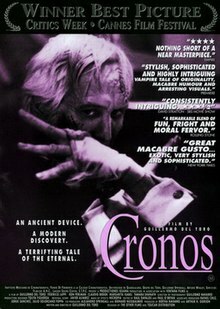 Angel de la Guardia (Ron Perlman) is searching for a device known as “Cronos.” The rumor states that whoever possesses the device is given eternal life, which is why Angel’s wealthy, dying uncle, Dieter (Claudio Brook), set him on task to find it. While many of the archangel statues that could contain the device prove to be empty, Angel just happens to run across an antique dealer at a party. This antique dealer was licking the blood off a bathroom floor, giving Angel enough of a hint that he pressures the man to divulge where the device is located. When the man refuses to talk, Angel kills him, only to find it is not easy to kill an immortal man. Of course, by now Angel is tired of waiting for his inheritance and decides to take his fate into his own hands, despite Dieter coming quite close to obtaining the Cronos device. Sometimes, to play a tough guy, all you need is the voice. Ron Perlman has had many roles where either he’s covered in makeup, or only his voice is used to convey a character. While Hellboy has been his most recognizable role in this state, he has also played the titular Beast in the Beauty and the Beast TV series that ran in the late 1980s. Regarding his voice work, he’s lent it to characters in such animated fare as Titan A.E. (2000), Battle for Terra (2007), and Tangled (2010). He has even voiced CGI characters in live-action films like Percy Jackson: Sea of Monsters (2013). Perhaps his voice is all he needs to convey that Ron Perlman swagger, but it is still fun to watch him work his acting magic when he’s covered in makeup. Case in point, I have trouble separating many of his other characters from his eponymous role in 2004’s Hellboy. 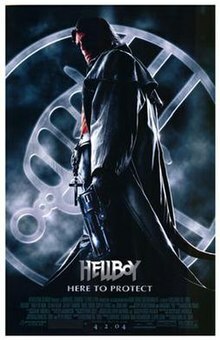 Summoned from a portal that led to hell, Hellboy (Ron Perlman) has spent the last 60 years hidden away in a secret government facility. The Bureau of Paranormal Research and Defense (BPRD) uses Hellboy, along with a team of supernatural beings, to perform missions to keep the United States safe from the dangers of the paranormal world. In that time, he has developed a crush on a pyrokinetic human named Liz Sherman (Selma Blair). Unable to express his true feelings to her, he watches in jealousy as a new FBI agent, John Myers (Rupert Evans) starts a friendship with her. Meanwhile, Grigori Rasputin (Karel Roden), the man who brought Hellboy into this world, has been causing trouble for the BPRD as he continues to execute his plan to bring hell to earth and control the supernatural powers for his sinister benefit. tagged as Battle for Terra, Blade II, Cronos, Hellboy, Hellboy II: The Golden Army, Pacific Rim, Pacific Rim: Uprising, Percy Jackson: Sea of Monsters, Ron Perlman, Tangled, Titan A.E. As a society, we seem to have a love/hate relationship with puppets. While we enjoy films featuring puppets as the main characters, like in Pinocchio (1940) and The Muppet Movie (1979), we also fear them in movies like Child’s Play (1988) and Goosebumps (2015). Aside from the aforementioned Muppets, a rare few films actually use puppetry exclusively for their characters. The one exception to this was the Thunderbirds in their movie, Thunderbirds Are Go (1966), and its modern parody, Team America: World Police (2004). Even if these films prominently feature puppets, they don’t necessarily delve into the details of puppetry itself. The act of controlling a puppet can be quite the challenging talent to acquire, but pulling the strings of a marionette isn’t the only way to engage in puppetry. This week’s two films highlight some different puppetry scenarios. There have been some films focused on humans controlling humanoid robots. From the original Ghost in the Shell (1995) to its live-action remake in 2017, the idea of extending a person’s life through the human mind controlling a robotic body via mental puppetry isn’t new. Robocop (1987) and Chappie (2015) both emphasize the idea that humans can use machines to live their life when their bodies are no longer able to. The concept is rarely reversed, though. It is disquieting to think that a robot could control a human in the same way we control them. As humans, we already possess the skills needed to make puppets of our fellow humans. Through coercion, blackmail, and other forms of manipulation, we can control others to do our bidding. Only one film explores the ability for a human to control another human from the inside: Being John Malkovich (1999). Famed actor, John Malkovich (himself), decided to make a rather drastic career change and become a world-renowned puppeteer. 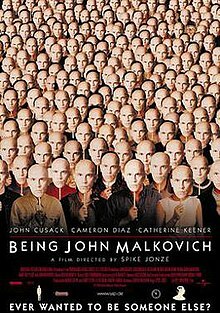 Unfortunately, this was not actually Malkovich’s decision, as Craig Schwartz (John Cusack) was controlling his body at the time. Craig was a down-on-his-luck puppeteer who happened to find a portal into the body of John Malkovich by chance. Initially, the portal only allowed for 15 minutes inside Malkovich to experience the life he lives. Using his skills as a puppeteer, Craig found that, not only was he able to control Malkovich, but he was able to stay inside the portal for as long as he wanted. However, the portal is not meant for him and the organization that plans to use the portal to prolong their immortality proceed to enact a plan to get Craig to vanquish himself from the portal, allowing them to take his place permanently. It is interesting to note that puppetry, while usually relegated to humanoid objects smaller than their puppeteers, can be used to control objects much larger than the one controlling them. Even the one-for-one puppetry scale referenced in the previous section pales in comparison to the giant robots known as “mecha.” A staple of anime and manga, mecha are usually large humanoid robots piloted by a human. There have been some notable entries in this sub-genre, including Gurren Lagann, Star Driver, and Neon Genesis Evangelion. The hallmark of these series has usually been either battles between mecha or (more commonly) battles against giant monsters. 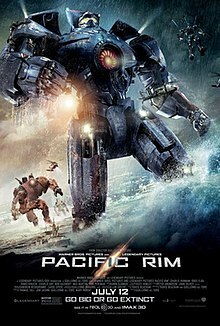 When Pacific Rim (2013) came out, I became excited about potentially seeing these mecha anime adapted into live-action films. For right now, I’ll just have to settle with its soon-to-be-released sequel, Pacific Rim: Uprising (2018). Giant monsters called Kaiju began emerging from the depths of the Pacific Ocean and wreaking havoc on the nearby landmasses. To combat this threat, a multinational alliance started building gigantic robots called Jaegers. These Jaegers were too big to for a single human to pilot them, so the concept of “drifting” was created to share the mental load between two or more pilots. When the frequency of the Kaiju attacks left the Jaegers helpless to defend the Earth, the world leaders scrapped the project in favor of building a coastal wall. When this wall also fails, the commander of the Jaegers hatches one final plan to close the portal between our world and the universe of the Kaiju. Using the last few working Jaegers, the mission to detonate a nuclear device in the portal commences just as the largest Kaiju ever emerges from the rift.